As the name suggests, "irregular" galaxies have no specific form, and so the group contains a very diverse selection of objects. In fact, there are two types of irregular galaxy. Type I's are usually single galaxies of peculiar appearance. They contain a large fraction of young stars, and show the luminous nebulae that are also visible in spiral galaxies. Type II irregulars include the group known as interacting or disrupting galaxies, in which the strange appearance is due to two or more galaxies colliding, merging or otherwise interacting gravitationally. Type II's appear to contain a large amount of dust. Despite the name "irregular", some systematic structure is observed in the type I galaxies. In fact, they are most closely related to spirals, with discs and bulges like their more orderly counterparts. Here the similarity ends, however, as the discs of irregular galaxies show no sign of spiral structure, and the galactic bulges are located away from the centre of the object ("centre" in this case being a somewhat loose definition!). 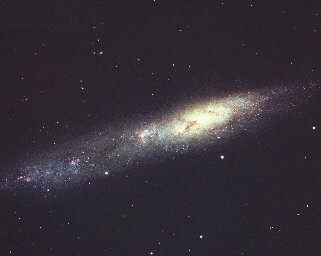 The type I irregular galaxy NGC 55 shown right, and imaged by the Anglo-Australian Observatory, clearly shows the presence of a galactic bulge, to the right of "centre". 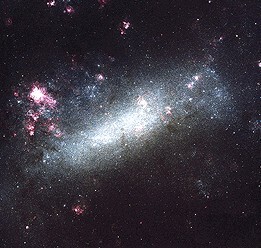 NGC 55 is actually quite similar to the Large Magellanic Cloud (LMC) shown at the top of this page, although the similarity is not immediately apparent because we see the LMC from a "face on" perspective, whereas NGC 55 is seen edgeways-on. Also visible in this image are dark patches (dust lanes) and light "spots", which are luminous nebulae. These galaxies can be regarded as "primitive" as they are relatively poor in "heavy" elements (i.e. elements higher up the periodic table than Helium). In contrast, galaxies like the Milky Way are rich in these elements, which have been manufactured by stars in a process called nucleosynthesis (see the section on stellar evolution). Irregulars are also very rich in clouds of hydrogen, which, when heated by nearby stars, glow to form the luminous nebulae. Type II irregular galaxies are remarkable, and often very spectacular, objects. They can be formed by several mechanisms. One of the most common is a gravitational interaction with another nearby galaxy. The idea of collisions between galaxies might at first seem unlikely. If galaxies were evenly scattered there would be so much space between them that only one collision would occur in around 100 times the age of the Universe. Galaxies often exist in clusters, however, where the average spacing between cluster members is much smaller. Collisions are therefore more likely, allowing the creation of the amazing objects that we see through our telescopes. Astronomers have simulated such collisions between galaxies using powerful computers to try to determine the effect on stars in one galaxy when another passes close by. You can watch a movie of these simulations by clicking here (courtesy of the Space Movie Archive). In this simulation, astronomers have modelled the collision of two galaxies of equal mass. The shapes that are formed bear a remarkable resemblance to some type II irregular galaxies actually observed. The simulation also shows regions where star formation is triggered by the compression of gas in the objects. The red regions signify high rates of star formation, whilst blue areas are less intense. (This research was carried out by Chris Mihos and Lars Hernquist of University College, Santa Cruz). The simulation represents a total duration of around 1.5 billion years. 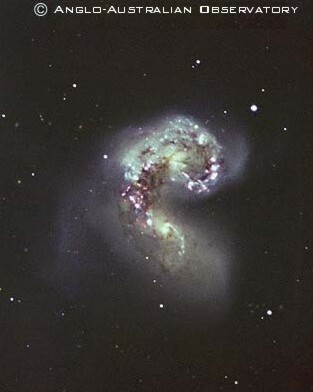 One of the best known interacting galaxies is called the Antennae. This image of its core (left) was taken by the Anglo-Australian Observatory. This object is made up of two "NGC" (New General Catalogue) galaxies: NGC 4038 and NGC 4039. The scale of this image is huge, with the two cores separated by a distance of approximately 65,200 light years. Not visible in this picture are two huge streaks of dust and gas which make up the tips of the Antennae. The tips are separated by some 500,000 light years. There are many regions of star formation occurring in this object, especially in the core. 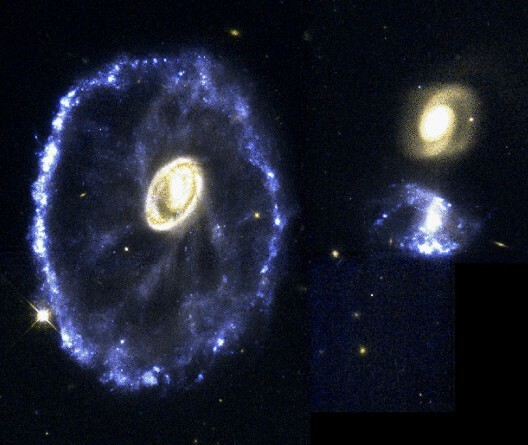 The Hubble Space Telescope also imaged a very unusual galaxy known as the Cartwheel (below right, courtesy of STScl/NASA). This is also a product of galactic collision. In this case, a small galaxy (which may be one of the objects on the right of the ring) passed through the middle of the main spiral galaxy, causing the compression of gas and dust. The ‘wave’ produced then moved towards the outside edge of the galaxy, leaving newly formed stars in its wake. It is estimated that billions of stars were created in this collision. You can find out more about this object by reading the original press release. Another well known example of an interacting galaxy is the Whirlpool, or M51, which is shown on the left. 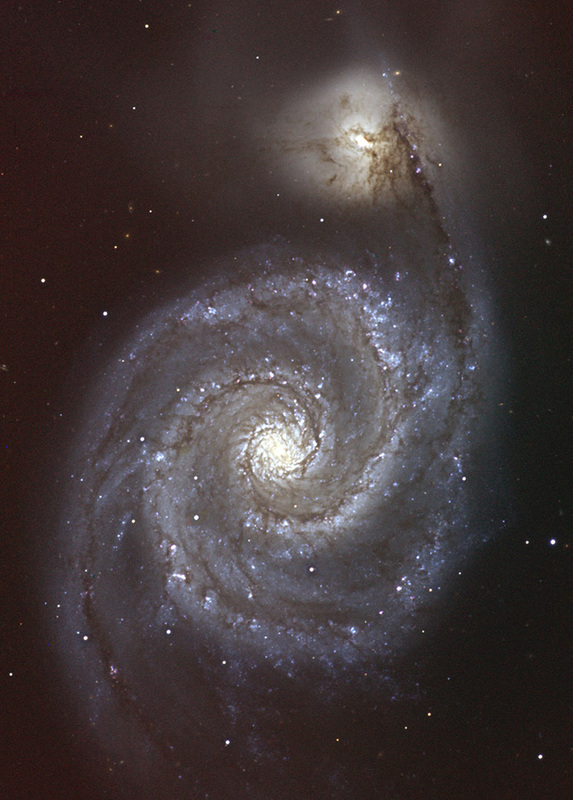 This image clearly shows the two galaxies that make up M51. The large, face on spiral is NGC 5194, estimated to have a mass of some 100,000,000,000 solar masses. The smaller galaxy (appearing as a bright patch directly above the main object) is NGC 5195. This galaxy seems to be developing a spiral structure, although the shape is very difficult to detect, and at present it is more properly classified as an irregular. Studies have shown that the collision of two uniform disc galaxies (with no spiral shape) may cause a spiral structure to develop. It is therefore possible that the spiral structure of the larger of the Whirlpool galaxies was caused by the collision. The Milky Way has two irregular "satellite" galaxies, called the Large and Small Magellanic Clouds. These can easily be seen with the naked eye from the southern hemisphere, appearing as bright patches in the Milky Way. The LMC has a mass approximately one twentieth of the Milky Way's. The average distance to these clouds is about four times the diameter of our galaxy, and it is this small separation that causes the systems to interact. This interaction results in a connecting stream of gas running from the clouds to our own galaxy, which is detected by astronomers observing at radio wavelengths.